Violent migrants will turn Americans against generous asylum policy. Migrants on Sunday stormed the U.S. border near San Diego, and from the media coverage you’d think the culprits were the Border Patrol agents who used tear gas to disperse the mob and defend themselves. 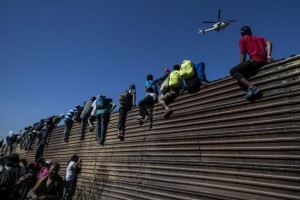 But the officers were right to repel the crowds, and the tragedy is that such lawlessness will undermine support for legal asylum in the U.S. Hundreds of migrants overwhelmed Mexican law enforcement and rushed north, and some stormed the car lanes at San Ysidro, the Western Hemisphere’s biggest land-border crossing. Others surged through gaps in the nearby border fence. The United States can’t tolerate migrants who rush the border or assault officers with rocks. Members of the same caravan defied officers last month to push through the Honduras-Guatemala border and later the Guatemala-Mexico border. U.S. Customs and Border Protection spent weeks preparing for a similar rush, and to its credit no one sustained serious injury on Sunday. President Trump responded with typical overkill, threatening on Twitter Monday to “close the Border permanently if need be.” That may have been an attempt to get Mexico’s attention, but closing the border would hurt the U.S. too. That’s also a message for U.S. immigration activists who too often sound as if migration anywhere is a natural right. Sunday’s real victims are Central Americans who have respected U.S. law even as they flee genuine persecution, and who are waiting in Tijuana to seek asylum legally at the U.S. port of entry. Violence and lawlessness erode public support for a generous asylum policy. Germany is the cautionary tale. Even Hillary Clinton recently acknowledged that Chancellor Angela Merkel erred by admitting a million Middle Eastern migrants in 2015. The result has been a political backlash that has abetted the far right and turned many Europeans against non-passport transfers within Europe.